An example of anisotropy is light coming through a polarizer. Another is wood, which is easier to split along its grain than across it. In the field of computer graphics, an anisotropic surface changes in appearance as it rotates about its geometric normal, as is the case with velvet. Anisotropic filtering (AF) is a method of enhancing the image quality of textures on surfaces that are far away and steeply angled with respect to the point of view. Older techniques, such as bilinear and trilinear filtering, do not take into account the angle a surface is viewed from, which can result in aliasing or blurring of textures. By reducing detail in one direction more than another, these effects can be reduced. A chemical anisotropic filter, as used to filter particles, is a filter with increasingly smaller interstitial spaces in the direction of filtration so that the proximal regions filter out larger particles and distal regions increasingly remove smaller particles, resulting in greater flow-through and more efficient filtration. In NMR spectroscopy, the orientation of nuclei with respect to the applied magnetic field determines their chemical shift. In this context, anisotropic systems refer to the electron distribution of molecules with abnormally high electron density, like the pi system of benzene. This abnormal electron density affects the applied magnetic field and causes the observed chemical shift to change. In fluorescence spectroscopy, the fluorescence anisotropy, calculated from the polarization properties of fluorescence from samples excited with plane-polarized light, is used, e.g., to determine the shape of a macromolecule. Anisotropy measurements reveal the average angular displacement of the fluorophore that occurs between absorption and subsequent emission of a photon. Images of a gravity-bound or man-made environment are particularly anisotropic in the orientation domain, with more image structure located at orientations parallel with or orthogonal to the direction of gravity (vertical and horizontal). A plasma lamp displaying the nature of plasmas, in this case, the phenomenon of "filamentation"
Physicists from University of California, Berkeley reported about their detection of the cosine anisotropy in cosmic microwave background radiation in 1977. 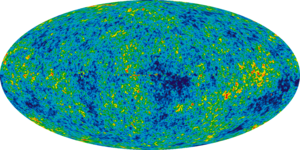 Their experiment demonstrated the Doppler shift caused by the movement of the earth with respect to the early Universe matter, the source of the radiation. Cosmic anisotropy has also been seen in the alignment of galaxies' rotation axes and polarisation angles of quasars. Physicists use the term anisotropy to describe direction-dependent properties of materials. Magnetic anisotropy, for example, may occur in a plasma, so that its magnetic field is oriented in a preferred direction. 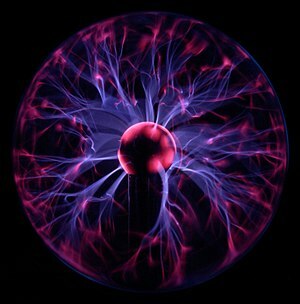 Plasmas may also show "filamentation" (such as that seen in lightning or a plasma globe) that is directional. An anisotropic liquid has the fluidity of a normal liquid, but has an average structural order relative to each other along the molecular axis, unlike water or chloroform, which contain no structural ordering of the molecules. Liquid crystals are examples of anisotropic liquids. Some materials conduct heat in a way that is isotropic, that is independent of spatial orientation around the heat source. Heat conduction is more commonly anisotropic, which implies that detailed geometric modeling of typically diverse materials being thermally managed is required. The materials used to transfer and reject heat from the heat source in electronics are often anisotropic. Many crystals are anisotropic to light ("optical anisotropy"), and exhibit properties such as birefringence. Crystal optics describes light propagation in these media. An "axis of anisotropy" is defined as the axis along which isotropy is broken (or an axis of symmetry, such as normal to crystalline layers). Some materials can have multiple such optical axes. Seismic anisotropy is the variation of seismic wavespeed with direction. Seismic anisotropy is an indicator of long range order in a material, where features smaller than the seismic wavelength (e.g., crystals, cracks, pores, layers or inclusions) have a dominant alignment. This alignment leads to a directional variation of elasticity wavespeed. Measuring the effects of anisotropy in seismic data can provide important information about processes and mineralogy in the Earth; indeed, significant seismic anisotropy has been detected in the Earth's crust, mantle and inner core. Geological formations with distinct layers of sedimentary material can exhibit electrical anisotropy; electrical conductivity in one direction (e.g. parallel to a layer), is different from that in another (e.g. perpendicular to a layer). This property is used in the gas and oil exploration industry to identify hydrocarbon-bearing sands in sequences of sand and shale. Sand-bearing hydrocarbon assets have high resistivity (low conductivity), whereas shales have lower resistivity. Formation evaluation instruments measure this conductivity/resistivity and the results are used to help find oil and gas in wells. The hydraulic conductivity of aquifers is often anisotropic for the same reason. When calculating groundwater flow to drains or to wells, the difference between horizontal and vertical permeability must be taken into account, otherwise the results may be subject to error. Most common rock-forming minerals are anisotropic, including quartz and feldspar. Anisotropy in minerals is most reliably seen in their optical properties. An example of an isotropic mineral is garnet. Anisotropy is also a well-known property in medical ultrasound imaging describing a different resulting echogenicity of soft tissues, such as tendons, when the angle of the transducer is changed. Tendon fibers appear hyperechoic (bright) when the transducer is perpendicular to the tendon, but can appear hypoechoic (darker) when the transducer is angled obliquely. This can be a source of interpretation error for inexperienced practitioners. Anisotropy, in Material Science, is a material's directional dependence of a physical property. Most materials exhibit anisotropic behavior. An example would be the dependence of Young's modulus on the direction of load. In such a case anisotropy could be effectively measured directly from its stiffness tensor independently of its origin which may for instance be its texture, randomness of internal composition or defects. Texture patterns are often produced during manufacturing of the material. In the case of rolling, "stringers" of texture are produced in the direction of rolling, which can lead to vastly different properties in the rolling and transverse directions. Some materials, such as wood and fibre-reinforced composites are very anisotropic, being much stronger along the grain/fibre than across it. Metals and alloys tend to be more isotropic, though they can sometimes exhibit significant anisotropic behaviour. This is especially important in processes such as deep-drawing. Wood is a naturally anisotropic (but often simplified to be transversely isotropic) material. Its properties vary widely when measured with or against the growth grain. For example, wood's strength and hardness is different for the same sample measured in different orientations. In the Mechanics of Continuum Materials, isotropy and anisotropy are rigorously described through the symmetry group of the constitutive relation. Diffusion tensor imaging is an MRI technique that involves measuring the fractional anisotropy of the random motion (Brownian motion) of water molecules in the brain. Water molecules located in fiber tracts are more likely to be anisotropic, since they are restricted in their movement (they move more in the dimension parallel to the fiber tract rather than in the two dimensions orthogonal to it), whereas water molecules dispersed in the rest of the brain have less restricted movement and therefore display more isotropy. This difference in fractional anisotropy is exploited to create a map of the fiber tracts in the brains of the individual. where 'i' denotes incident direction and 'v' denotes viewing direction (as if from a satellite or other instrument). And let P be the Planar Albedo, which represents the total reflectance from the scene. ^ Smoot G. F.; Gorenstein M. V. & Muller R. A. (5 October 1977). "Detection of Anisotropy in the Cosmic Blackbody Radiation" (PDF). Lawrence Berkeley Laboratory and Space Sciences Laboratory, University of California, Berkeley. Retrieved 15 September 2013. ^ Tian, Xiaojuan; Itkis, Mikhail E; Bekyarova, Elena B; Haddon, Robert C (8 April 2013). "Anisotropic Thermal and Electrical Properties of Thin Thermal Interface Layers of Graphite Nanoplatelet-Based Composites". Scientific Reports. 3. doi:10.1038/srep01710. PMC 3632880. Archived from the original on 11 August 2016. Retrieved 11 August 2016. ^ R.J.Oosterbaan, 1997, The energy balance of groundwater flow applied to subsurface drainage in anisotropic soils by pipes or ditches with entrance resistance. On line: . The corresponding free EnDrain program can be downloaded from: . ^ Kocks, U.F. (2000). Texture and Anisotropy: Preferred Orientations in Polycrystals and their effect on Materials Properties. Cambridge. ISBN 9780521794206. ^ Sokołowski, Damian; Kamiński, Marcin (2018). "Homogenization of carbon/polymer composites with anisotropic distribution of particles and stochastic interface defects". Acta Mechanica. 229 (9): 3727–3765. doi:10.1007/s00707-018-2174-7. ^ Truesdell, Clifford; Noll, Walter (2004). The Non-Linear Field Theories of Mechanics - Springer. doi:10.1007/978-3-662-10388-3. ISBN 978-3-642-05701-4. Look up anisotropy in Wiktionary, the free dictionary. "Gauge, and knitted fabric generally, is an anisotropic phenomenon"
DoITPoMS Teaching and Learning Package: "Introduction to Anisotropy"